Please fill out and submit this request form for any swatches you would like to review. You can request up to 12 nylon swatches. Please refer to the name assigned to the fabric color as well as the pantone number assigned by the converter of the fabric. The pantone number is a handy reference to the color accuracy of the fabric, but it is indeed a reference; we cannot guarantee exact color matches of pre-dyed nylon. Also, please remember that you are viewing these colors on your monitor which may not accurately represent the exact color due to differences in calibration of monitors. 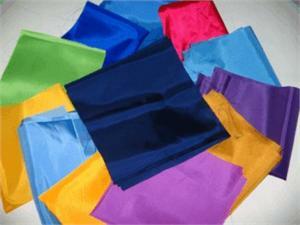 We will assemble and send you the appropriate swatches of the colors you request. These are scissor cut swatches measuring about 6" square (approximately).